This kit contains 5 new film capacitors for the integrator circuit. 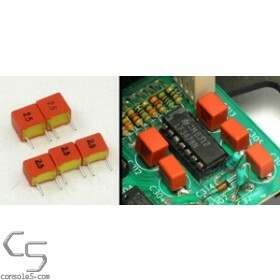 These new capacitors are of higher tolerance and less prone to aging than the OEM styrene caps, keeping the vectors drawn more accurately. Some Vectrex have factory-installed film caps - please check your Vectrex before ordering to ensure that you don't already have this upgrade. Styrene caps will be silver cylinders and non-styrene are red "chicklet" style. Note that the service manual incorrectly lists all 5 caps as .01uF parts. For the majority of Vectrex units, a corrected listing is available in the wiki. Please double-check your Vectrex before installing as there may be additional combinations of installed values. If you have one of these uncommon versions, please contact us so we can document this change in our reference wiki!